There was a slight stir a month ago when some right-wing nutcases complained that this film about an evil empire run by white men oppressing a poorer group of mixed ethnicities and genders somehow portrayed them in a bad light. This is a laughable criticism but Rogue One does contain a segment that could be taken as an indictment of the US's handling of the middle east. On Jedha, a desert planet containing ancient religious artifacts, the Empire has set up a garrison in the capital to protect its mining operation that provides the substance that powers the Death Star. Faceless white storm troopers arrogantly patrol the by-ways and markets backed by mechanical armor but the local population is ready to explode into armed rebellion. When the rag-tag bunch of freedom fighters launches an ambush on a crowded street involving explosives, the film invites us to sympathize with the attackers against the oppressors. 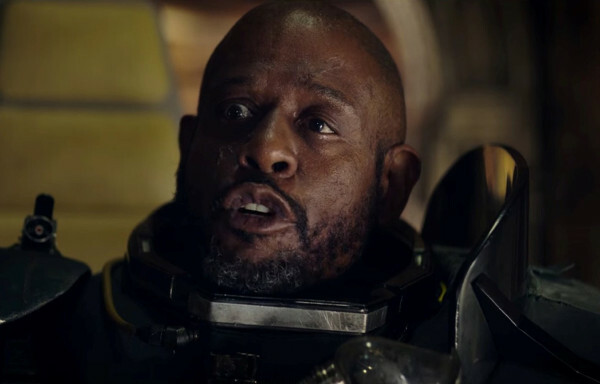 Later we find that the attack was organized by a fanatic Gerrera - Forest Whitaker in a cave. The imagery surely must be intentional, from the huge battleship-esque Star Destroyer hovering near the city to the drone-like craft whizzing back and forward supporting the well armed and technologically advanced occupiers. Remove the Star Destroyer and change the uniforms and maybe take away a few of the aliens and the same scene could have come from a film set in Iraq or Afghanistan. Rogue One's script is a few years old and the film had some last minute reshoots; I wonder without any inside information whether the original cut of the film made the allusion to the War of Terror more explicit. That would have made Rogue One a much more interesting film, albeit probably an unreleasable one. People have joked for decades that the Rebel Alliance are basically terrorists against a legitimate government; a film examining this idea or at least justifying the rebellion's use of force would be amazing. Certainly all the characters are in place for the film to go this way but what we ended up with seems rather watered down. I thought Gerrera was an interesting addition, a brutal man siding with the good guys but he dies almost immediately and we never really see why everyone thinks he goes too far. The leader of the rebels has a line of dialog that makes it clear that she doesn't agree with Gerrera's methods even though they certainly use him. Is that a moral position to take? He doesn't seem that much worse than the rest of the rebels. These are some heavy concepts for a Disney film but Rogue One refuses to engage with them. Or maybe I am just imagining things.